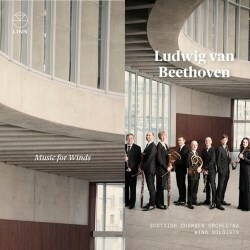 This is an attractive collection of Beethoven’s wind music, all from early in his career despite the high opus numbers on two of the works. While Mozart’s influence is everywhere present, Beethoven’s own thumbprints are also unmistakable. The Scottish Chamber Orchestra (SCO), as is their normal practice for music of this era, employs natural (valveless) horns but modern woodwinds. The horns provide a nice, rustic sound that still blends well with the woodwinds. All the works on the programme are tuneful and idiomatically scored. The Duo for Clarinet and Bassoon, one of three such pieces, though, is of questionable origin. While those pieces are charming, there is “little stylistic evidence to prove their authenticity,” so states Colin Lawson in his informative notes in this disc’s booklet. The Sextet and Octet, both in the key of E flat, are definitely by Beethoven and are delightful works scored with distinction. The Sextet, composed in 1796, had to wait until 1805 for its first performance and was published only five years later. Thus, its high opus number which makes it appear to follow the Fifth and Sixth Symphonies. Its instrumentation of clarinets, bassoons, and horns dates back to a well-established mid-eighteenth century tradition. The work’s four movements, Allegro (with an Adagio introduction), Adagio, Menuetto (with Trio), and Rondo finale, also follow Viennese tradition. The SCO musicians perform splendidly, seeming to really enjoy what they are doing, and the sound is state of the art. I first got to know the Octet many years ago from a treasured Chamber Music from Marlboro LP that also contained Dvořák’s Wind Serenade. I haven’t heard that Beethoven recording for many years, but I can confidently say the SCO musicians are as good here and provide real pleasure. It is thought Beethoven composed this Harmoniemusik, comprising two each of oboes, clarinets, bassoons, and horns, for his patron in Bonn, Elector Maximilian Franz. As with the Sextet, the Octet was published long after its composition—this time in 1830 after Beethoven’s death. However, there was an earlier version of the work, the String Quintet, Op. 4, published in 1796. Like the Rondino, also in E flat and originally intended as part of the Octet, this work features the horn in some passages. Its virtuoso horn runs near the end of the first movement are particularly notable. Alec Frank-Gemmill and Harry Johnstone play them supremely well, but then, all of the instrumentalists are first rate. The Octet, like the Sextet, is in four movements, but here the third movement Menuetto is really a scherzo that anticipates similar movements in later Beethoven. The Rondino has similar scoring to that of the Octet, and the clarinet’s use of the chalumeau register is noteworthy. Duetting horns begin the piece with a songful melody and are muted near the end of the work as the music dies away, creating a strange effect. In addition to the rather inconsequential Clarinet and Bassoon Duo, the programme contains an occasional piece, the March in B flat that starts quietly, as if from a distance, and gradually becomes louder until it appears in the foreground. This short march, which concludes the disc, acts as an appropriate encore to what has preceded it. In every way these are exemplary performances in clear, close, but warm sound of some of Beethoven’s lighter music, which warrant an enthusiastic recommendation from me. Linn has encased the CD in an attractive bi-fold album with a pocket for the booklet that contains photos and notes about each of the SCO musicians and a well-written discussion of the works.